I've decided to put together a list of different card folding techniques, and then slowly work through the list to produce instructions and examples on how to go about making each card. I've come up with a pretty good list of cards so far, but I need your help in finishing it off. If you can think of other types of folds that aren't mentioned below, please let me know and I'll add them. I'm not looking for techniques, such as embossing or stamping, but actual folds or types of cards. Let's see what we can put together! There is a double side-step card too...that one has two ends that are up and the stairs in the middle!!! GREAT IDEA!!! Thanks Beccy! What a fabulous idea. This will be my go to site for ideas. It is really hard (at least for me) to find them when I don't know what they are called. :) Thanks! Thanks for putting this all together. I can't wait to try some of these new cards! I love this idea! Thank you for doing this. Love your site and helpful reference idea. Thanks, Beccy. Just a few I came up with. I have been trying to compile a list but have not gotten down to it. Funky Fold Card, Tilt Card, Exploding Card, Expolding Box Card, Pyramid Fold Card, Pyramid Stacker Card, Decoupage Card, Window Card, S Fold Card, Diamond Fold Card, Triangle Tri Fold Card, Vest Card, Shirt Card, Double Slider Card, Slider Window Card, Trellis Card, Magic Window Card, Flip Flop Card, Triptych Card, Fun Fold Card, Iris Fold Card and Spring Fold Card. I have been using the Internet as a wealth of information on learning how to make cards. Out of hundreds I have viewed yours is definitely the best site ever!! I can't open all of the Techniques on Card Folds - is it because they are not on your site yet? Thanks for all the great techniques and the different card folds. Thanx so much for all the effort you put into this list! It's FAB and a real big help to all of us looking for new, fun and different ways to do our cards! SOOOOOOO APPRECIATED!!! Aloha! This is fabulous to have all of these in one place. I have wanted to try some of these and didn't know the names of them. Thanks so much for all your hard work. I am now a follower. This is a fantastic resource thanks sooo much for taking the time to do this I will be trying them out one by one and hoping you will be adding more - you are a star!!! Thanks for the good directions! I found exactly what I was looking for. This is absolutely fabulous! For the novice card maker like myself this is an invaluable source of information. Just the time alone you put into this deserves a million thank yous. LOL the blogosphere should send you a thank you card! I am looking for a technique where the sides of the card are folded into the middle. A design is stamped on the inside, then on the back of the side folds designs are stamped and trimmed so that when folded back into the center, it creates a picture, i.e. house in center, with snowman on left fold and sled on right fold. I hope I am explaining this technique well enough for you to understand what I mean. Thank you so much for posting these. I can't wait to try some of them. May I ask why some of the links no longer work? The list is still a work in progress and there are lots of tutorials that I still haven't done yet. I'll keep working away on them, but I expect to be a very old lady by the time I'm finished!!! Muchas gracias por tu trabajo. Tus creaciones son magníficas. Really really really enjoying these tutorials. Having only just started 3D cards, I can't wait to try the other ones. Already done the easel, zig-zag and the criss-cross cards. Thanks! Thanks Di, will add it to the list! This is an amazing resource. I'm so thrilled I found it. Hi Beccy. Just been told about your site by my friend Wendy. It´s really great and thanks very much for all the ideas. WOW- I feel like I just found a bag of gold! Thanks. How do you keep your paper from buckling when you've glued it to the cardstock & fold it? The problem you're experiencing happens because the act of folding actually stretches the cardstock / paper slightly, which is why is becomes weaker at the crease. There are a couple of solutions to the problem, depending on where the fold is and what it's going to be used for. You could try folding both the cardstock and the paper and then attaching them together while already folded. No extra stretching will occur this way. However, if you are going to be unfolding again, as in a card opening, you will still get the problem of buckling. Alternatively, you can cut your patterned paper in half and place one piece on either side of the cardstock fold. The cut will open and close as the cardstock is folded. A third option is to simply use patterned cardstock. These days you can easily find a huge array of wonderful digital papers that print beautifully onto cardstock. The problem of folding and buckling will no longer be an issue. Thank you for such an inspiring site, plus all your hard work. Best wishes from the U.K. Jan.
Just found your site and love, love, love it. I am new to papercrafting and cards and was so in neeed of something like this, thank you. Merci pour tous ces merveilleux tutos, cela va m'aider énormément, quand je suis en manque d'inspiration et surtout pour l'usage du scor pal martha stewart que je viens d'acquérir et que j'ai du mal à utiliser pour faire les boites. j'espère que vous êtes toujours aussi passionnée et vous souhaite bonne continuation. Suis désolée mais je ne sais pas m'exprimer en anglais. Wow, just found this and I'm definitely bookmarking it in order to return to it many times, there is so much here that I haven't even heard about before! Thank you! Whoa. This is fantastic. Your sharing generosity is also fantastic. this is the kind of list you could charge for or even do your own book and publish it. I would buy it. But I have to say again, how truly selfless of you to offer it to all of us at no cost. GOD BLESS YOU! You site was shared on a Cuttlebug Facebook page, this is fantastic. Are you still working on some of the instructions? Any way to get an email when a new one Is completed? thank you for all your hard work! I generally do one new card fold tutorial each month. If you'd like to receive email updates, simply add your email address to the box in the left hand column of my blog that says "Follow by Email". I hope you don't mind, but I have shared your blog on a Facebook group 'Tips for Crafters'. You have given me so much to look through, learn, experiment & eventually have a go at. I will try to make a few & if they look as half as good as yours, I'll be more than happy. I don't mind at all... thank you for sharing my blog! Thank you for sharing all your "folded cards" ideas. I love a challenge and have enjoyed trying out many of the different folds. Hi Beccy, thanks so much, cant wait to try some of these! New to card making - been watching YouTube videos to learn different folds. WOW so nice to find a more comprehensive list all in one place. Thanks! Thank you for this index of card folds. Best Regards.D. I am so glad I found you! Your tutorials are great Thank you so much!! I really appreciate people who share their ideas and the time you spend to share with everyone. Thank you for putting this together. It's nice to have one index of card folds and one place to find them. Hello Beccy - thanks for this great list of different folding cards. I have to say this is a really amazing list of folding techniques. Thank you for going this ... I believe I will be coming here often! Hi Sue. Thanks for your lovely message, I'm glad you've found something useful on my blog, I really enjoy putting it all together. I too, am an Aussie who only learned the metric system at school, but for some reason when I started to scrapbook many years ago, the tools were all in imperial. From there I simply got used to the system. Most of the folds don't require you to be exact, so you can generally do a rough conversion. 1" = 2.5cm and 1/4" is about 6mm. You can purchase very reasonably priced rulers that have both metric and imperial, as well as cutting mats, which I highly recommend since most paper craft is measured in the imperial system. I'm not sure how my blog shows up on phones, but down the left hand column there is a place where you can add your email address to receive updates to your inbox. Have a fabulous day Sue! Thanks for the tip Holly! I'll do some research and have a go at creating one. Thank you for sharing your God blessings talent with the whole world. I greatly appreciate every card that you have on this site and can't wait to see more. God bless you in all you do. 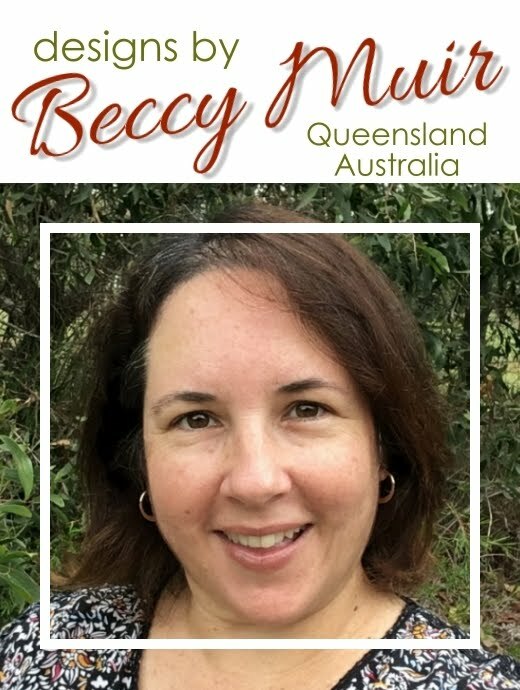 Beccy, Thank You!! I've been making hand made cards for many, many years for immediate family, gradually making them for extended family, then as many as 80 (identical) Christmas cards, new design each year for several years. Then I was given a few catalogs from a friend. I reworked some of those ideas and advanced my card-making. Recently, I discovered Pinterest (long after family discovered Pinterest. But Beccy, the biggest help was this card-folding tutorial! Great ideas, clear instructions, AND all in one place! Thank you, thank you, thank you!!! Thank you for the lovely comment and you're most welcome! I'm so glad to read that it's been helpful to you, I really enjoy putting the tutorials together and sharing them with other card makers. Thanks for sharing this wonderful list Beccy!